Happy with you life, but just can't keep the weight off lately? Find it hard to diet and exercise after you settled down? Prevent obesity from ruining your happiness. 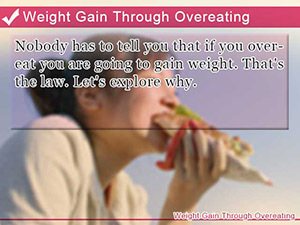 Continuing where we left of in part 1, we are going to go over weight gain issues related to overeating. You don't have to be a health expert to know that overeating results in you gaining weight. The problem behind developing strategies to address this issue lies in understanding human behavior, with emphasis in areas that makes us vulnerable to gaining weight. You would be surprised how easy it is to be put in a situation that if continued would ultimately lead to your obesity. Figure out the root of the problem that is causing you to overeat! There are many factors that go into why you may overeat, such stress or treating yourself during the holidays. Although for some people happy with how life is treating them it may be easy to feel content with gaining weight also; however as you put on weight in excess, the task of losing it becomes a problem. No matter how happy you may be, developing a strategy before things go overboard is recommended. Stress is one cause for gaining weight. As you build up stress and reach a point where you need to relieve yourself, it's difficult not to eat your heart out. By gorging on your favorite foods, it's possible to relieve stress temporally. This causes your calorie intake levels to rise to a point where your body has nothing else to do but store it as fat. Moreover, putting on weight can cause you to feel stressed as well. This creates a vicious cycle, which makes stress and overeating turn into a habit. In order to prevent this from happening, it is necessary to find something other than eating to relieve stress. Find something to keep you active. Not only does it help your weight issues, moving around helps you relieve stress. What is it that you tend to overeat when stressed? When stress builds up, serotonin is used by your body to combat stress. Serotonin not only helps you battle stress, it plays and important part in helping you feel full after eating. As your body uses up serotonin to battle stress, it becomes harder to satisfy your appetite. This is why it is easy to overeat when stressed out. Life events such as getting married or just being satisfied with your relationship often trigger weight gain. This category of weight gain can be split into several different types. On reason why men gain weight is by eating to much of their wife or girlfriends home cooking. This is often the case when a man after living alone for so long finally gets his hands on something good to eat, he finds it hard to resist. 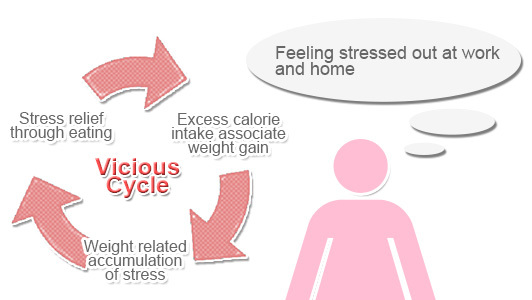 A reason why many women gain weight is that changes in lifestyle and environment cause stress. Although there be many factors leading to this stress; but I have a hunch that it may be related to being able to finally live together with the person they've been longing for and just being happy with themselves that it's easy to let they're diet slip. Whether you are a man or a woman, you don't like to eat along. That is why you are more likely to wait for your partner to come home before eating. This has the potential to put you in situations where you are always eating late, which over time makes it easier to gain weight. Also, as you try to spend more time with your family, you have fewer opportunities to exercise. There are more people who fit this category than you would think. For stress related issues in this category are taken care of in the same manner as you would attack stress associated weight gain issues address previously. If you are a person in this category who is over eating, it is advised that you moderate the amount you eat and save extras for later. However, in the beginning when you start a new life with your partner, it might be better not to hold back. Resisting the food that your partner put so much love into making can potential inflict collateral stress in the relationship. Don't worry, there's got to be a way to work things out. 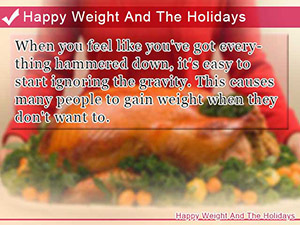 It's easy to put on weight on the holidays, such as the time you spend with your family during Thanksgiving and Christmas dinner. During this time it is common to eat past full, because everyone is doing it. Worst than that, during Thanksgiving among other things, you eat a lot of turkey. You may be asking the question, what did they put in that turkey, right? The answer is that they didn't. Turkey is known to contain L-tryptophan, an amino acid that is thought to make you sleepy. That's not all. As fun as the holidays sound, it is easy to stress out. The things you do over the holiday may differ greatly that what you are use to while busy working trying to make a living. Within the warm comforting environment that the holidays helps you create, it is easy to make yourself vulnerable to make decisions that go against your diet. This column along with part1 introduced many representative reasons why people gain weight. It is easy to misinterpret the cause of you weight gain problems as being related to eating or exercise. This makes it hard at times to uncover the real problem to these issues. If you are able see very clearly which side of the line you stand, it helps you in knowing where to start when beginning to search for the right diet program. Stop binge eating and compulsive overeating ruining your diet. Diagnose bulimia nervosa before it’s too late. Steps to get treated right away. Compulsive overeating is a recurring issue in the diet scene. Everyone wants to know how to stop compulsive eating to take their diet to the next level. Hungry already? See how you can now eat more and still lose weight with balanced meals and a smarter diet. Keeping the fat off has never been easier. Nobody has to tell you that if you overeat you are going to gain weight. That's the law. Let's explore why. 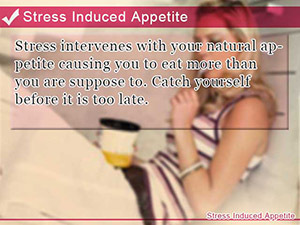 Stress intervenes with your natural appetite causing you to eat more than you are suppose to. Catch yourself before it is too late. When you feel like you've got everything hammered down, it's easy to start ignoring the gravity. This causes many people to gain weight when they don't want to.